..::| Chalet des Roses .:. Location .:. Chalet des roses, hotel, Antananarivo, Madagascar, tana, analakely, pizzeria, pizza, italia, cafe, caffe, bar, cucina italiana ristorante, albergo, italiano, restaurant, hotel, italien|::.. 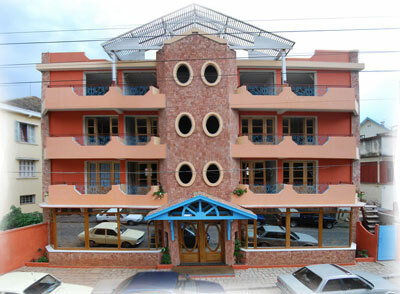 The hotel/restaurant Chalet des Roses is located in Antananarivo, the capital of Madagascar, specifically in the quarter of Antsahavola. The hotel is centrally located in the heart of the city – surrounded by the American, French and Swiss Embassies, and numerous international banks – ensuring a safe and vibrant environment to conduct business or administrative affairs. After descending the grand staircases characteristic of the “high city” quarter, one can easily access the main market of Tana (Antananarivo) called Analakely, which means “little forest” in Malgashe (the local language). There, one can find all types of artisan objects, local foods, and a view into the fascinating daily life of the Malgashe people. Just five minutes by foot from the hotel is the major point of reference for the entire city, the Avenue of Indipendence. Along this classically designed avenue are the central offices of Air Madagascar, cyber cafes, culture centres, retail stores, taxies and public transportation. For those looking for a bit of nightlife, a short climb from the hotel is Isoraka, the centre of nightlife for Tananariviens. The city of Antananarivo, often referred to as “Tana”, is situated in the centre of the high plateau Malgashe, at about 5000 feet above sea level. Rivers and picturesque rice plantations surround this city of hills. “Antananarivo” Signified “the city of thousands” – referring to the first garrison of thousands of soldiers by the king Andrianampoinimerina, becoming the first great city of Madagascar. Today, it is a true metropolis with almost two million inhabitants.